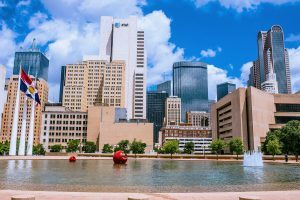 Event Description: An exciting place to participate in a corporate teambuilding event, 21st century Dallas — from its historic West End entertainment district to the hometown BBQ ribs and the rowdy gridiron Cowboys — is a real smasher. If you think all there is to Dallas is the grassy knoll and the Book Depository, then it’s clearly time to give “Big D” a fresh new look! During your corporate teambuilding treasure hunt…you’ll explore the rapidly renovating downtown district, with its skyscrapers, both new and old, its glittering public artwork, and the red Pegasus sign, rotating patiently above the old Mobil Building. Follow a trail past sparkling Pegasus Plaza (with its fountains celebrating the nine Greek muses) and rip-roaring Pioneer Plaza (with its herd of 30 over-life-size bronze steer). Pardner, there’s a new sheriff in town; his name is Sheriff Clue.